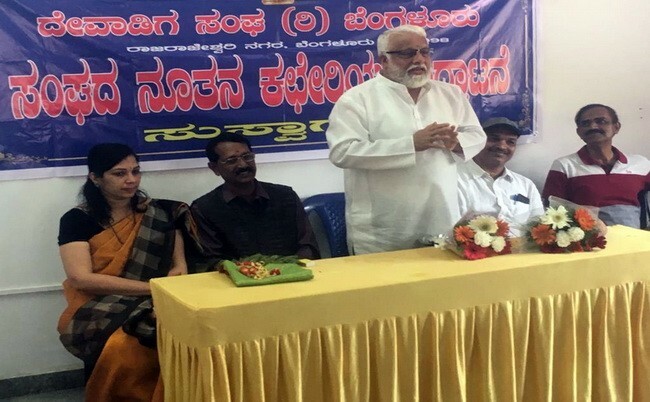 Bangalore: Yet an other successful step by us at Devadiga Sangha (R) Bangalore. On 2nd December 2018, we moved to our own office at No: 6, Ideal Home Township, Rajarajeshwari Nagar, Bangalore. The thoughtful thinking & effort by President Shri. K. Chandrashekar few months ago has paid off in starting our own office for the Sangha. We would like to cherish this memorable movement by mentioning our special thanks to Shri. K Chandrashekar & team. 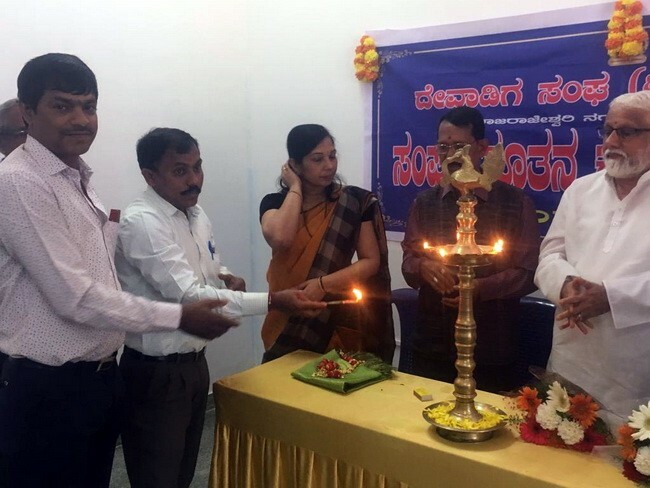 The day started with Gana Homa followed by inauguration of our new office by Cheif Guest Shri. U Raghu Sherigar,Past President, hri. Ramesh, ACP & Shri. 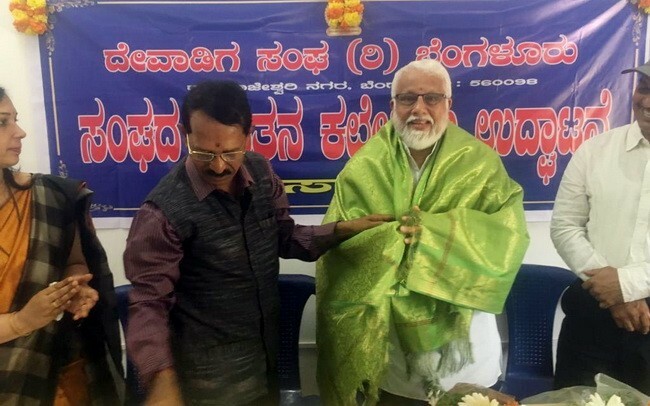 Ganapathi, Retd Executive Engineer, Karnataka Power Corporation. Shri. 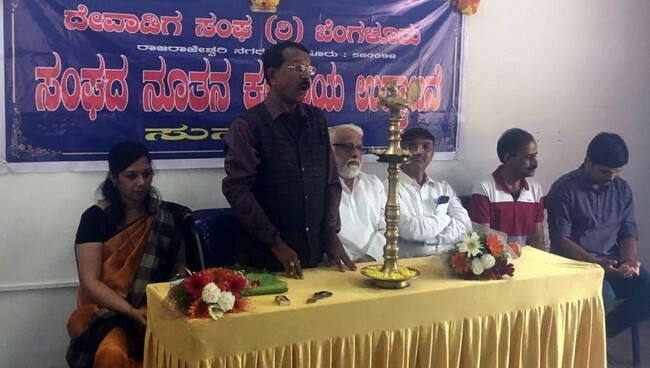 Ganesh Raju, Gen. Secretary conducted the programme. Shri.U.Raghu Sherigar while addressing the gathering said that it was a tough task to economically sustain the Sangha at the time of difficult situation. However today he expressed his his happiness & cherished the present moment and conveyed that that he will be will available and be part of the future development of our Sangha. Shri. 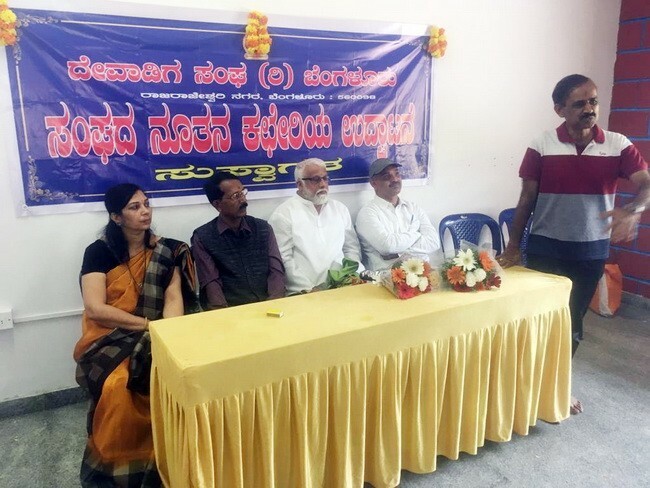 Ganapathi Retd Executive Engineer, Karnataka Power Corporation our Sangha's senior member who attended with family remembered their days & efforts in organising Rajkumar Nite to raise fund. 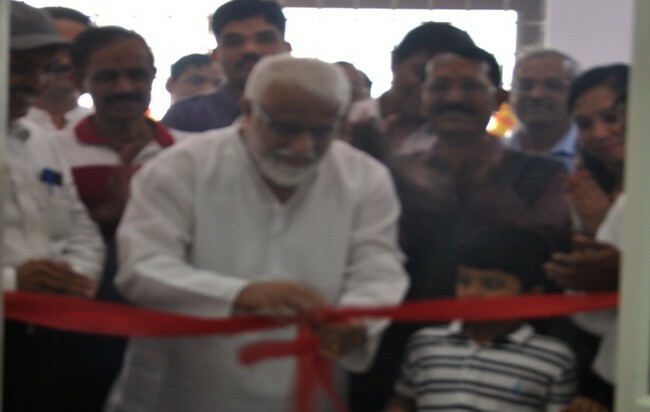 He expressed his happiness on the new building and its potential to earn revenue. Shri.Ramesh,ACP said he will involve himself in organising the sangha and also announced Rs. 1,00,000/- towards building fund & paid Rs.10,000/- as token advance. Later participating in the committee meeting he gave us good insight in to how to strengthen the Sangha. Sangha with gratitude also felicitated & honoured Shri. U. Raghu Sherigar for serving as Gen Sectetary & President of the Sangha for many years. 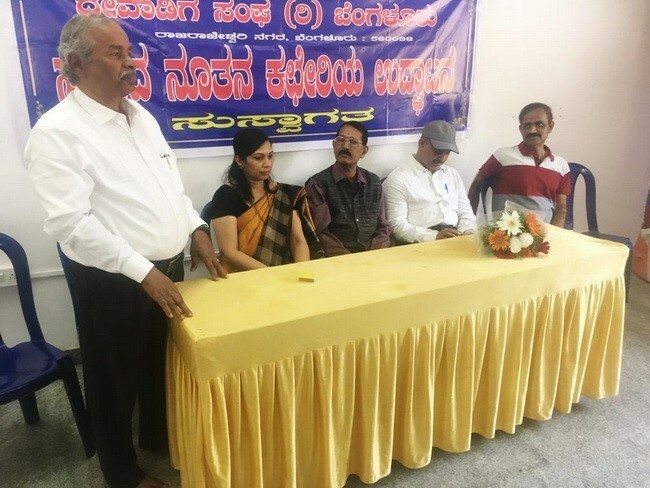 Shri.Ganesh Raju, Gen. Secretary while delivering the report of the Sangha expressed his thought that sangha should get into multiple activitiies concerning to social issues related to serving our community. Shri. Ramesh Vandse & Shri.S M Chandra also associated themselves in organising today's inaugural function. In the first committee meeting held in our new office; we thanked Shri Subhas.N for donating Rs. 10.00 lakhs and as per his request the committee agreed to name the Vedike in the proposed community Hall as "Shri N.Narayan Rao Vedike". Many other issues were discussed with regard to different schemes to collect the funds to complete the proposed building. It was also decided that Shri. Keshav Devadiga will be appointed as Honorary Office Manager for the Sangha. 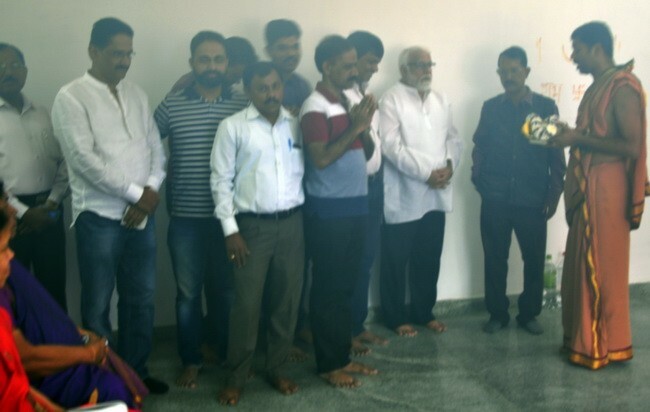 Sangha thanked Shri Keshav Narayan Rao for making all the arrangements for the Pooja and to Smt. Rekha Suresh, President of Mahila Ghataka & Shri. Shivashankar Devadiga Yuva Ghataka for arranging snack and being part of the Pooja. We thank all our community members for participating in the inaugural of our Sangha's office.